Brand new from Playtech is this action-packed online slot themed on the deities of Ancient Greece; it’s called Age Of The Gods and while the theme is similar to Age Of The Gods: Furious Four, there are enough differences to make it stand out – it comes with a variety of bonus features and a progressive jackpot. 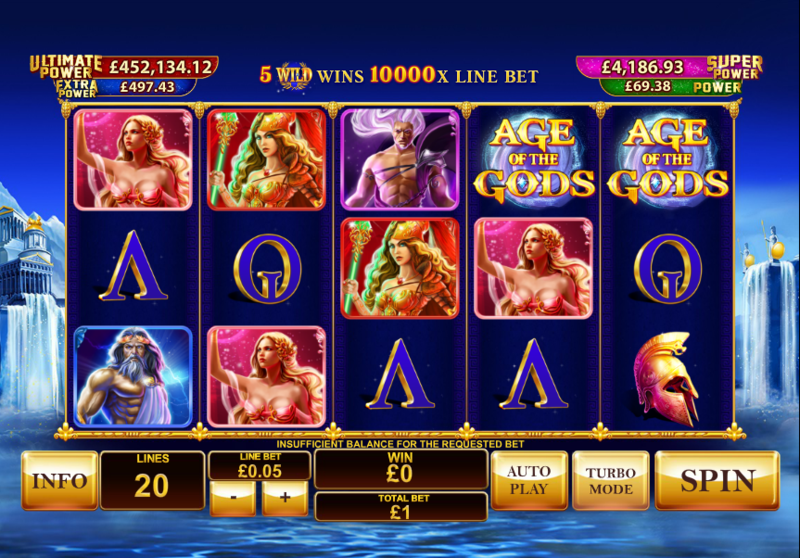 Age Of The Gods is a five reel slot with three reels and twenty fixed paylines; those gold-rimmed reels float against a backdrop containing the palaces of the gods with water cascading into through columns into a large lake. This is triggered by landing the various gods shown below in any order on an active payline; manage this and you will receive 200x your line bet. Athena – nine free spins with a prize multiplier of 2x to 5x on each spin. Zeus – nine free spins with the multiplier increasing by 1x every three spins; wild is locked in the centre position of reel three for the entire round. Poseidon – nine free spins with up to five extra wilds added to the reels after each spin. Hercules – nine free spins with the Hercules wild stacked on reel three for the duration of the round. This is a randomly awarded on any paid spin but the higher your bet, the more chance of it happening. When it does you’ll be taken to a screen displaying a 4×5 grid and you just have to select the coins on the grid until you find three matching – a win is guaranteed. The four jackpots available are Ultimate Power, Super Power, Extra Power and Power. Age Of The Gods is actually quite different from it’s Furious Four namesake and so it’s well worth checking out, especially if you like this theme; the variety in the bonus features is excellent and of course there’s a progressive jackpot to add to the fun. It comes with an RTP of 94.03% – 95.02%.